Looking back on it, I might as well have said “let’s build a rocket ship” I was so out of my element. But now, three months later and after gaining experience with log tongs, ridge poles, and reimagined “non-permitted structure” foundations, I’d compare it more to building a Boeing-787. Still well out of my element, but just a little less. 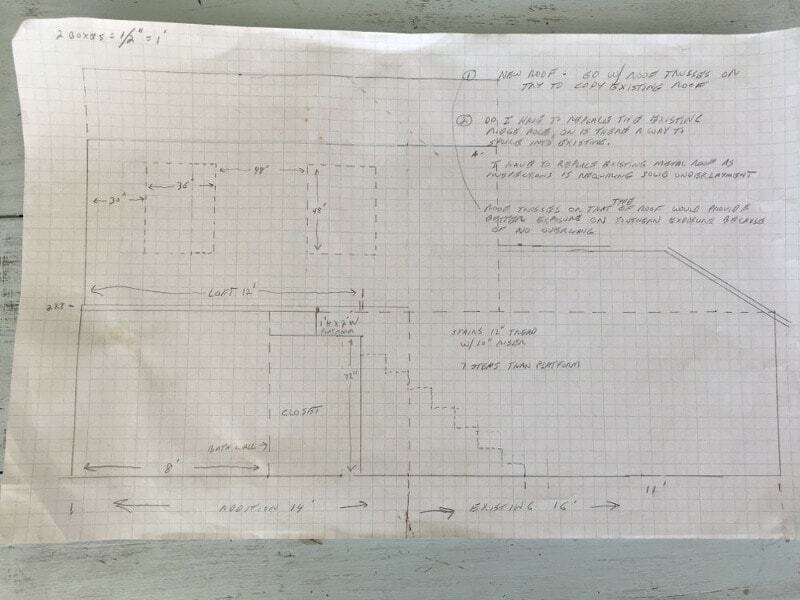 Recently, my dad and I set out to build a tiny house, a project that had been left on the cutting-room floor for quite some time. There were many reasons for the delay, some legitimate, some attributed to laziness, but I’m sure that my lack of experience didn’t help speed up the cause. 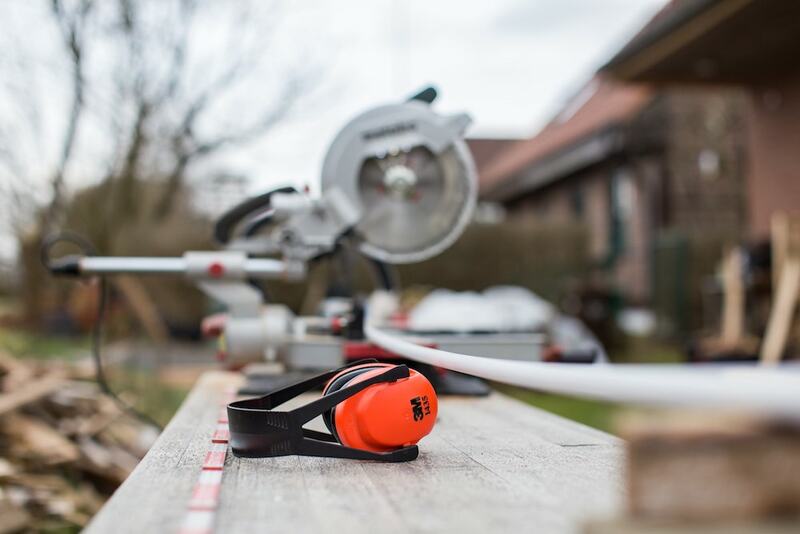 Having worked on my father’s rental houses since I was no taller than a step-ladder, I know the basics about home repair and maintenance. Growing up, many Saturday mornings were spent dropped off at strange lands, with a checklist of tasks to accomplish, and an estimated time of pickup when the objective is expected to be completed, which made it feel more like a tour of ‘Nam than property maintenance. The undertakings varied wildly, as did my level of enjoyment while accomplishing them. From light demo work (every boy’s dream) to mowing duty despite a severe allergy to grass that required weekly shots, I did whatever I could, leaving the big jobs for those much more talented with a claw hammer. In the event that you incorrectly believed I’ve learned over the years or if I came off as falsely modest or self-effacing, consider that my last endeavor of fixing a bike tire almost caused me to have a nervous breakdown. What should have been a fast project quickly turned into an ordeal. I started after work, took a dinner break and had to sleep off the frustration to restart in the morning. I was 29. I’m not proud of this, especially when you take into account who my dad and brother are. Both accomplished carpenters and handymen, my dad has been building houses for the better part of 4 decades, and my brother helped him build an addition to our home when he was just 15. They put the roof on in eight hours, which, if you think like me, could have been time better spent watching The Godfather two and a half times in a row. I remember looking up from the ground in my tae-kwon-do uniform with amazement, wondering if one day I’d be able to try that. For better or worse, that day is here, but I can’t stop thinking that I’d rather be watching the coming of age tale of a young Vito Corleone instead. The dream began eighteen years ago when we bought a plot of mountainside land with the intention of one day making it our highland abode. At the time, the property contained a 10 x 12 hunting shack with a potbelly stove that had never been connected, an irrepressible abundance of mice, and not much else. We’d been planning to add to the existing structure for quite some time, but had never gotten around to it. Initially, my thought was that I’d learn to build as I bonded with my father, and I’d be lying if I said that I didn’t have clichéd mental images of my dad and me looking at a finished house as the sun set on an exhaustive day of hard work, and him turning to me as he puts his arm around my shoulder and saying “you’re a natural”, or “wow, we did that quick”, or something to that effect. But the building never started, and things just kept not happening, as they tend to do. After years of sitting at a desk, I found myself in a digital marketing position that was going nowhere (to be fair, the job itself was fantastic, but not for me. Also, we had standing desks). I did what any semi self-respecting, confused, late-twenties man would do. I made a hard left turn and hoped it would go unnoticed, and maybe, dare I say accepted. This was the photo that did me in. At our last family gathering, my uncle called me out for just that. In his mind, I was just another millennial that wanted to momentarily shed the salmon colored shorts and t-shirt of the start-up lifestyle in favor of something more. My uncle saw right through this and exclaimed, louder than necessary, that I wasn’t building at all and that I just wanted to be seen on social media holding a shovel. I think I would have preferred it if everyone laughed, enjoying his ludicrous take on the situation, but instead they nodded their heads as though they all had the same thought themselves. For the record, it was my dad who asked for the photos on Facebook. I understand his side of it. I am choosing to be in this life, where many of my family members fell into it. I am just “dabbling”. I guess I have an unhealthy history of doing that. A decade ago I went to college—four and a half years of it, thank you very much— and came out the other end more uncertain than when I went in. I then moved abroad and returned with stories and incredible experiences, but no life altering direction. Life continued on until eventually I found myself at the foot of the Shenandoah Mountains, where I hoped to prove something to myself, though I was unsure what. The problems started almost immediately. 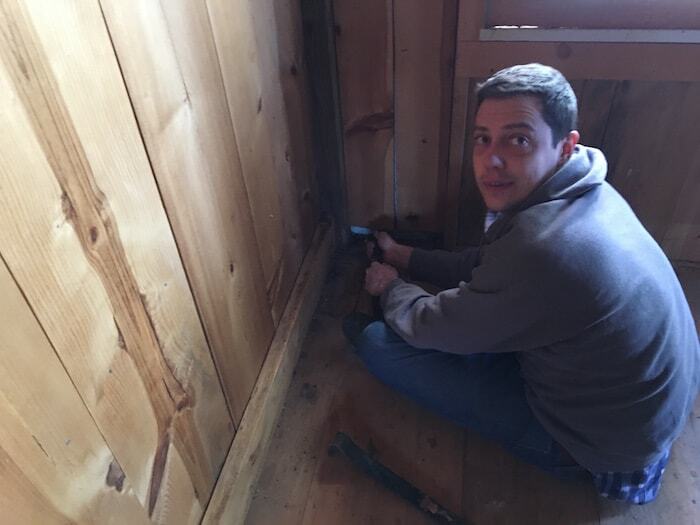 Adding to the existing structure creates some complications that building a tiny house from scratch would avoid. Like any construction project, we were subjected to the litany of permits, regulations, and other wonderful red-tape, but also had the challenge bring a 30+ year-old structure up to today’s confusing and nebulous code standards. In pure governmental bureaucratic fashion, we were given a dossier of requirements on how to build our mountain sanctuary by people who’d never step foot in the finished product. The irony is so thick you can cut it with a Sawzall. I’m not sure what I am doing here either. The core crew consisted of me, my dad, my brother and anyone else saintly enough to wake up at 6:30am in the middle of Virginia winter and offer help. More often than not that included my girlfriend, undaunted by both the hard work and also seeing her boyfriend struggle to mix cement. The very first day we started slow, and made our own lumber by harvesting massive logs for eight hours. After that it would be as simple as digging a well, establishing power, and building the whole damn building. Needless to say I was firmly out of my element. But, to say I wasn’t much help would be a little harsh. I was able to pick things up and put them down in different places with the best of them, providing that they weighed a reasonable amount. But it took longer to learn the trade. I like to think that I just processed information much slower, like I’m the last person in a patient game of telephone between my dad and brother. It felt as if I was the guy you watch a movie with that’s always a few steps behind. “What is a galvanized nail?” was my equivalent of, “Wait, I thought he was a good guy.” “When is lunch?” roughly equated to “I’m not following this at all, I’ll be in the lobby”, and so on. Despite my astonishing shortcomings, personal progress eventually came. What was Greek to me at first became Latin, and then a still-confusing form of pig-Latin. But as the house took shape, I found my place in the process. 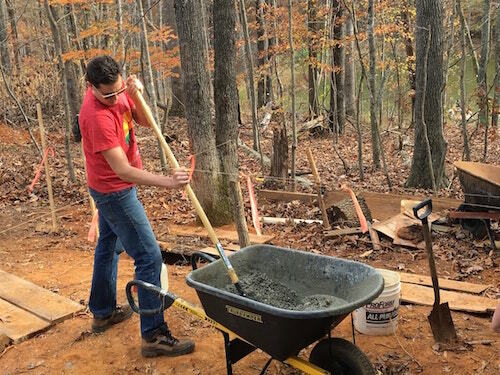 With the foundation grew my understanding of construction fundamentals—but honestly, I had nowhere to go but up. My success montage must have been great for an outside observer. Nails stopped flying in all directions. Wheelbarrows remained right-side up. I was cursing less. Granted, there is still a long way to go, and I’m no closer to Bob Villa than when I had started, but I came to a point where I stopped just staring and blinking when I was instructed to do something. The semi-finished project before we had to pause. 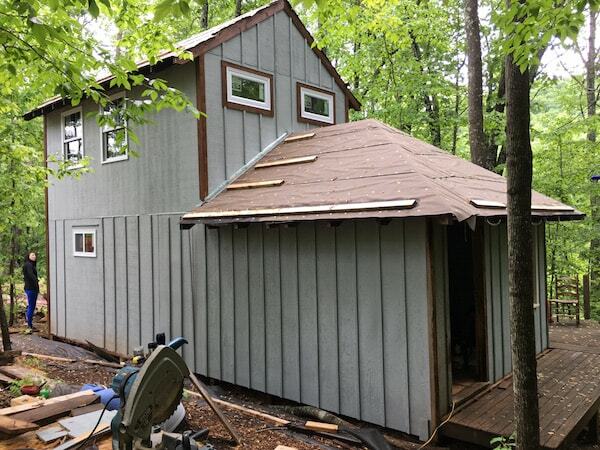 We were able to get the roof up, but with winter coming, conflicting schedules, and various other difficulties arising, we have paused construction. For me, however, that is more than enough to stop and tell my future grandchildren. Overcome with hubris—which from past experiences I know is fleeting—I made an effort to remember this transition for a rainy day. Despite having a difficult time spelling restaurant, and always putting an a in museum, I decided that when construction picks back up I’ll continue to chronicle the journey. Besides, we have no time for museums, and our meals consist of roast beef while sitting on a pile of wood, so I think I’m in the clear. My father and my brother might have drawn this, but I took the photos. This article was previously published on Tiny House Build.